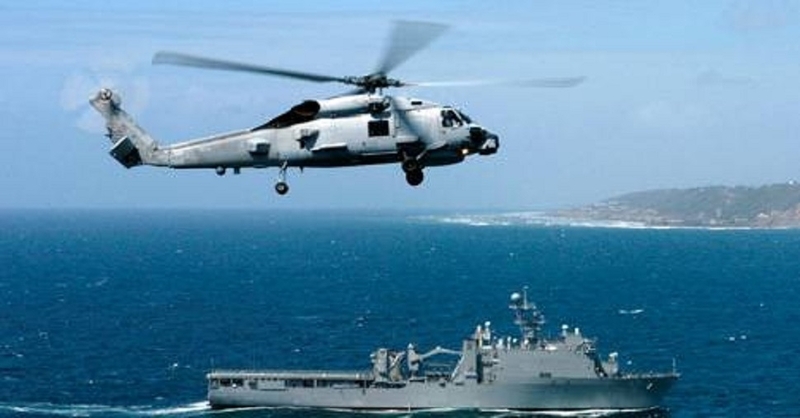 THE grant of presidential permission for sale of 24 submarine-hunting American Seahawk helicopters worth USD 2.6 billion is one more point forward in a series of cooperative moves between the United States and India over the past some time. That the move would add immensely to the strength to India’s naval prowess, is one side of the story, the other side being the success of ever-enhancing diplomatic script India and the US are writing together over the past few years. The addition of the Seahawk choppers will be of immense value to India’s defence and offence capabilities, and will push India’s status as a regional superpower to a notch higher. At this stage, this is what India is looking for. This Seahawk acquisition has many other dimensions to write home about: One, the United States has stopped harping against India’s almost equal cooperation with Russia and other countries as regards aggressive approach to the purchase of various tools of defence and weapons and ammunition systems. Just sometime earlier the US had expressed its displeasure over India’s acquisition of advanced missile system from Russia, going to the extent of hinting at possible slapping of sanctions against New Delhi. But as India stood firm in its resolve to refurbish its defence systems no matter from where it acquired those, the US tamed down and agreed upon offering to India some of its own weapons systems and tools and spares. The proposed transaction of Seahawk choppers is a welcome addition to those measures agreed upon by the US and India. In a way, this is a tribute to India’s diplomatic maturity and its enhanced position in global rating as a growing military power with a definitive role to play in international realpolitik. In the past some years, the US has been waking up to India’s improved diplomatic maturity and military capability. Of late, Washington has looked at India as a deserving partner in global matters particularly in the Indo-Pacific region. The Seahawk proposal indicates one more step forward by the US to lend India a greater international acceptance in critical areas of diplomatic activity. Per se, Seahawk are not going to add much to India’s actual military capabilities in comparison with the Chinese military prowess. But the acquisition will add to New Delhi’s military teeth because India is a responsible State knowing when to hit, how to hit, and how to conduct diplomatic business with maturity. This is the meaning of the Seahawk symbolism. In modern warfare, possibilities of actual use of weapons and systems is fairly limited. Those are used more as deterrence than as actual-deployment materials. The maxim is to build weapons power to avoid actual engagement in war. But world powers do not share their strengths with every nation everywhere. They are selective from the point of their own security perceptions. In the past some time, global superpowers have been looking at India as a nation with the ability to storm into the big league. Now that such a condition has been attained, other big players such as the United States or Russia or France got eager to forge partnerships with New Delhi on a lasting firmament. The Seahawk deal indicates India’s clear arrival in that higher league. It is more than clear that a lot of action can take place in the Indo-Pacific theatre in the next quarter of a century. It is also clear that India will have a much bigger role to play in matters of conflict or constructive partnerships. Even though China’s military capabilities are much greater than those of India, New Delhi, nevertheless, is considered as an effective counter-weight to the aggressive Chinese methods. This state has not arrived unilaterally with the superpowers agreeing to engage cooperatively with India; it has become possible also because India has carefully built its diplomatic action and military capabilities with a global vision of its own, with its own goals to pursue.